On August 21, 1865 a garrison of California Volunteer Infantry and Cavalry established the site of Fort Mason under command of Colonel Charles W. Lewis. The fort was established below the Spanish Colonial Mission site of Calabazas close to the present day International Wastewater Treatment Plant in Rio Rico, on the Upper Santa Cruz River 8 miles from the Mexican border. Fort Mason was established to conduct operations against Apaches, monitor the French secessionists, protect mail and transportation routes, and patrol the border area against Mexican imperialists and the Confederate Army. The old mission church ruins of Calabazas, which are now part of Tumacacori National Historical Park, were reused as the officers quarters for Fort Mason. Although the history of Fort Mason is mentioned in a few local histories and by scholars of California military history the full story of this short lived military outpost remains untold. Fort Mason was never finished and the fort was moved to Fort Buchanan at the headwaters of Sonoita Creek in 1866. The cavalry at Fort Mason included the California Native Cavalry lancers, the last of their kind who came to AZ looking to serve their country and to prospect for land and new beginnings. The Fort consisted of a tent camp, barracks buildings, hospital, some adobe quarters, corrals that were never finished. Almost forty soldiers died from “malarious fever,” most of who are now buried at the San Francisco National Cemetery. The archaeological site of Fort Mason and the earlier Camp Moore (1856-57) are located on private property owned by Rio Rico Properties. The site was excavated by faculty and students of Defiance College, Ohio, from the early 1970s through mid-1980s. The collections were never analyzed and there is not final report on the results of the investigations. Rio Rico Properties has deeded the artifacts and archives to the Arizona State Museum. With help from the Arizona State Museum AAHS arranged for the transport of these materials back to the Arizona State Museum. Volunteers, under the leadership of Homer Thiel, are currently currently preparing the 88 boxes of materials for analysis and curation. 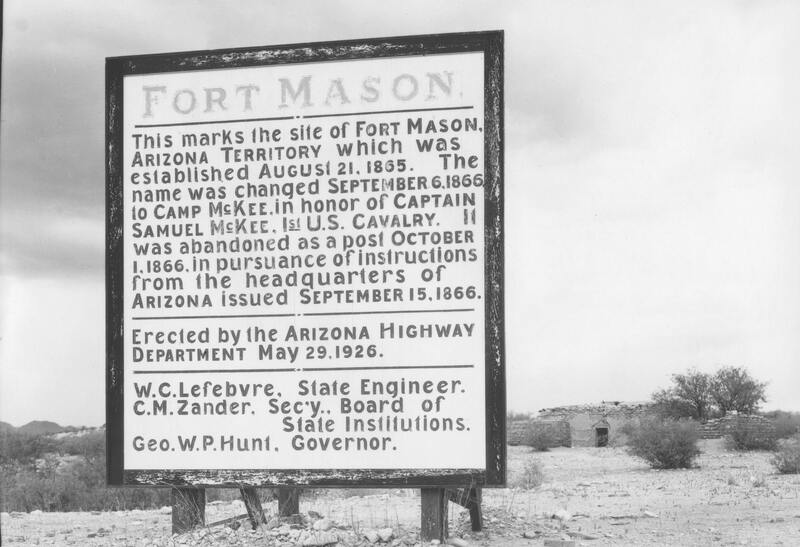 The goal to is to finally tell the full story of Fort Mason, and of those who were there during a particularly turbulent time in southern Arizona’s history. This acquisition is significant, both because of its obvious historical relevance to southern Arizona and its research value as a “snapshot in time” of military life in the Arizona Territory. We anticipate that the outcome in addition to proper curation of the collection, will be a final report and publication on the Defiance College excavations, and a temporary exhibit at the Arizona State Museum. Please donate and help support the acquisition and study of this important collection! Help bring this snapshot of Arizona history to life by donating to this exciting project.